Care of: Microwave and dishwasher safe. Packaging: Plastic bag, Polystyrene mug cube, boxed. You start your day with a cup of steaming hot coffee. What could be better than looking at an adored photo at the same time? It’s sure to put a smile on your face and start your day off on the right note. Others place our custom mugs on their work desk so they can see them all day long. Use it to actually drink something, or just use it as a pen and highlighter holder if you want. Or use it for a fun game of tabletop “dunk the paper ball” toss! 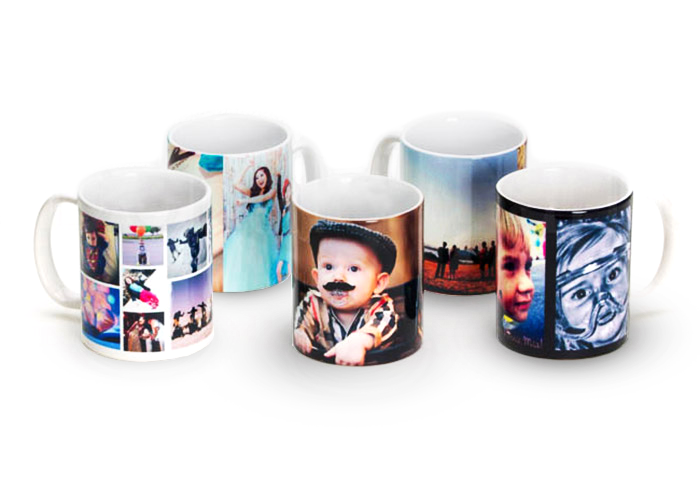 And of course, don’t forget that you these photo mugs make absolutely fantastic personalized photo gifts. They are super affordable, totally personalized, and something that the giftee will treasure for a long long time. Isn’t that so much better than a store bought random object that you are going to spend much more on? Our mugs are made of ceramic and are diswasher and microwave safe. After all, what’s the point of a gorgeous mug if it’s not functional, right? Or put your company’s logo on the photo mug and hand one out to each person in your company, and to clients too – build team spirit and brand recognition. Our mugs are incredibly reasonable to begin with. But if you want to order a large quantity, contact us, and we’ll work something out with you.